Mon - Noon: 7 miles (1,800') easy. Horsetooth north summit. Up South/Audra. A bit chilly out still, but a good trench pretty much the whole way up made for quality snow running. Strong sun meant that the melt was on despite air temps at or below freezing. PM - 4 miles (800') easy. Quick Falls loop before picking up Alistair from the bus stop. Tues - AM: 9.5 miles intervals. City Park segments. Workout was: mile (3 hills, slightly long), mile fartlek (1 hill, short), 1,200, 1,200 fartlek, 1,000 fartlek, mile fartlek (3 hill, long) w/standing rest of 3-5 mins between intervals. Good group (Brian, Mike, Ben) to keep the effort honest: 5:36 (5:28), 5:19 (5:25), 3:55 (5:16), 4:01 (5:23), 3:19 (5:20), 5:33 (5:25). Pushed the hard segments of the fartleks as much as possible, mainly by trying to hang on to Ben. Searching for that non-existent leg turnover. PM: 7.5 miles (1,900') easy. Horsetooth north summit. South/Audra. Started out at a really lethargic effort after the morning workout, but felt good once warmed up. The snow is melting quickly, so good and sloppy out. Got halfway up the north gap before turning back due to ice. Up the standard route. Weds - Noon: 8 miles (2,400') easy. Horsetooth north summit. Up southridge/Audra, down Wathan/Spring Creek/Falls. Trails are a day or two from being completely clear, but mega sloppy right now, which is always a refreshing change here on the desert Front Range. Up via the north gap, which was almost snow and ice free, then down a slushy Wathan. Took a peek at the falls, but not much action despite the melt. Gorgeous out, felt great and super fluid. Fitness feels good right now. Thurs - AM: 12 miles (1,400') hill tempo. Centennial out and back w/Mike, Celeste, Ziggy and Scott. Came back a little harder than planned, but nothing too crazy. Splits coming back were: 7:22, 6:14, 6:30, 5:30, 5:00. PM: 5 miles (1,100') easy. Felt pretty worked from the morning session, so backed off on heading up the hill in favor of a really easy Falls loop. Trails are now essentially clear and dry. Fri - PM: 9.5 miles (2,500') easy. After work with Burch. Horsetooth summit via Southridge/Audra, North Gap, then Wathan, Herrington, Stout, Spring Creek, Falls. Trails pretty firm the whole way around. Beautiful late afternoon weather. Sat - AM: 29.5 miles (7,700') long. Horsetooth Extravaganza. 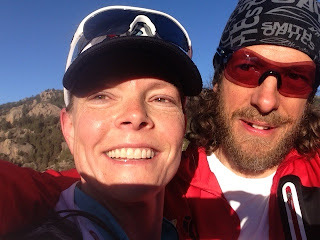 With Lory closed and a long run close to home on the docket, Burch and I decided to see if we could cover as close to every inch of singletrack in the park as possible without too much back and forthing. I think we ran a pretty efficient route to get the job done, but there might be some alternative turns to make the route even more precise. For those who know the trails (and care), route went: Southridge - Audra - South Summit - Rock - Westridge - Towers - Spring Creek - Wathan - Rock - North summit - Rock Trail - Soderberg - Spring Creek - Stout - Herrington to Spring Creek o&b - Herrington - Towers - Herrington - Loggers - Carey Springs - Towers - Mill Creek - Loggers - Sawmill - Nomad - Towers - Stout (right) - Sawmill - Loggers - Towers - Stout (right) - Spring Creek - Falls - Grim Reaper. Fun morning at a steady effort (4:45) on solid legs. Lots of people out running the trails, which is always great to see. Sun - AM: 16.5 miles (4,300') easy. Becky Wheeler was down on the Front Range in search of a little dirt, so we got out and ran around Horsetooth for a few hours. Good to see Becky back up and running after she broke her foot last year at Collegiate Peaks. Some titanium and a few screws, and she seems to be back on the road to fitness. 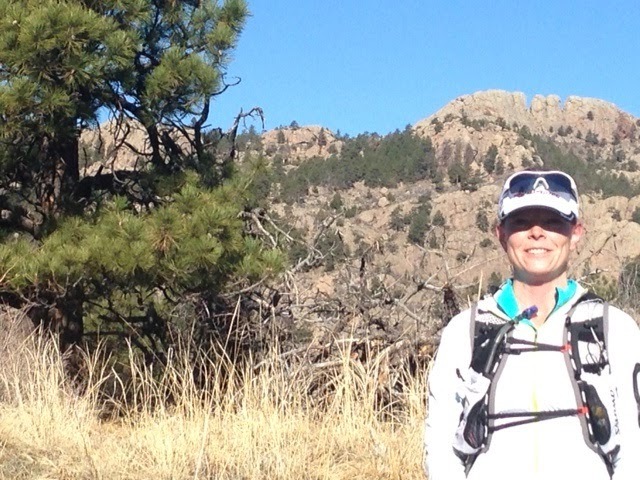 Becky will be among the favorites in the strong women's field at Quad Rock next month. Others to look out for will be returning champ Jenny Pierce, last year's runner up (and local legend) Steph Lynn, Anita Ortiz, Kerrie Bruxvoort, Meredith Terranova, Alyssa Wildeboer, and (The) Kristel Liddle, among many others. PM: 4 miles (1,100') hiking with Alistair and the neighborhood kids to top Milner Mountain - upon which we live - and back, from home after a beer - maybe two - too many at our Easter party. Sch'wacked from the spring on Hilltop. Fun outing. This ended up as a pretty solid week: couple of quality workouts, biggest mileage week of the year, heavy vertical, big long run - pretty much ticked all the boxes. Probably go by feel a bit for the next couple of weeks as I try to ride that line between onward progress towards summer goals and the desire to find a bit of freshness for Lake Sonoma on April 13. But essentially plan to run through Sonoma and keep the eyes on the prize. What else? Got down into the lower valley section of Horsetooth a couple of times this weekend to take a look at the southern part of the burn area, and while it all looks very barren without the long, dry grass, it was super encouraging to see regrowth already poking through. Give it another couple of weeks and I'm guessing it will be hard to tell from afar that there was even a fire down there. Very little burn in the trees, which is fantastic. Quad Rock is now full in both the 25 and 50 mile races, but we do have a waitlist and I'm sure spots will turn over through April given our refund policy, so get on that if you want to run. The QR training run is set for this Saturday and is open to everyone, registered runner or not. We've had to move it from Lory to Horsetooth due to continued trail closures in Lory, but same idea: get together with a bunch of trail runner folk, run for a few hours, kick back, eat some food, drink a beer or two, shoot the breeze, take the new PI E:Motions for a test ride if you want, go home. We'll meet at the main Horsetooth lot at 8:30 and do a 13 mile loop on the Horsetooth section of the course and then reverse for 26 (or just stick at 13). All abilities/paces welcome and likely to find company. More here. That's what I'd call a beastly week in every aspect (miles, terrain, vertical, quality). Good job, Nick! Hey Gary - yup, looking forward to it. Leave the HRM at home: time to race.